A week ago, I found this gem of a video on the need for blogging. Some valuable comments from Seth Godin and Tom Peters on why blogging matters to any professional. I couldn’t help but think of how much more important blogging is to small businesses and wondered how many small businesses actually blogged. More on that after the jump. I couldn’t agree more. One of the greatest benefits blogging has afforded me as a professional, is that it helps me organize my thoughts on topics that I’m passionate about. It helped me find my career calling – social media and community marketing through hours of thinking about what I wanted to say to the people who equally cared for the topics I loved. With small businesses, it’s even better. It helps you and your team organize your thoughts on how you’d explain your business to your employees, your potential customers, existing customers… I could go on. In the process, you either win over new customers or solidify existing partnerships. And, you can afford to be irreverent, controversial or plain useful to your audience and rest assured you’ve established a great repository of well indexed content on the web for future prospects to find you. And, we have data to prove that’s the case. Hubspot, an internet marketing company, tracked that companies that blog have a greater influx of visitors, inbound links, and indexed pages. This means two things for SMBs that blog: in the short term it potentially brings in a greater number of leads and in the long term it lets you build authority, page rank and SEO for your small business website and brand, yet again potentially leading to more leads. If you like similar content you should subscribe to my blog or follow me on Twitter! Let me finally leave you with the most important tip (measuring ROI on blogging) from a recent Mashable article that outlined 10 tips for corporate blogging, with a particular focus on small businesses. You’re probably accustomed to tracking everything, and your blog is no different. If your blog is a page on your website, make sure your current web analytics tools are set to track all the same data that it monitors on your website. If you don’t currently have a web analytics tool, check out Google Analytics, a free analytics tool with an easy-to-use interface. At the minimum, make sure you’re tracking site traffic, where referrals are coming from, and traffic-wise which posts are doing best. Learn from the data and adjust your blogging guidelines accordingly. 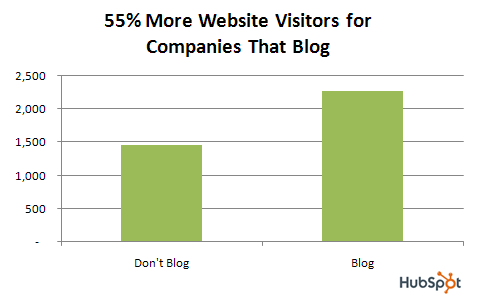 Whatever sized company without using blogs should be all concerned. blog is not only be free but you can even make profits from blogging. What’s more, blogging is a great way to publicize your organization and communicate with your readers who might be your current/potential customers.